NIGERIA AND GAMBIA TO PROMOTE CULTURAL TIES. 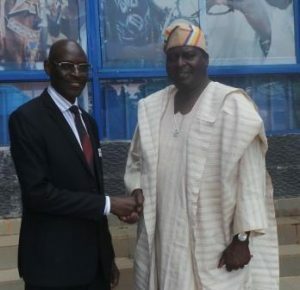 RIGHT –LEFT: OTUNBA OLUSEGUN RUNSEWE, OON,DIRECTOR-GENERAL (NCAC) IN A WARM HANDSHAKE WITH AMBASSADOR AMADOU S.O TAAL DURING THE LATTER COURTESY CALL TO THE CULTURE HEADQUARTERS, RECENTLY IN ABUJA. The Director-General of National Council for Arts and Council, Otunba Olusegun Runwese OON, while hosting the Gambia high commissioner in his office, Ambassador Amadou S.O Taal , reiterated the need to project African culture in its originality at every international fora. The culture helmsman emphasized that the development of African resides predominantly on our culture. According to Runsewe “if we harness our potentials in the culture industries properly, we will rule the world’. Runsewe, stated that the symbiotic relationship between Nigeria and Gambia dated back to 1940 when Nigeria and Gambia operated co-empires together. The Director-General added that if not for the trust the Gambia has on Nigeria; it wouldn’t have been impossible to put their military and even judiciary in the hands of Nigerians for co-ordination for so many years. The brotherhood spirit that exists between the two Nations can only be further enhanced and harnessed. According to Runsewe, the need to further showcase our endowment can be kick-started with the youths, in form of a holiday exchange programme in which we can take some of our selected youths to learn some of your culture, in term of dress code, food, dance and music, while the same thing could be organized interchangeably. Runsewe added that the Gambia delegation will be given a free stand at the forth coming African Arts and Crafts Expo ( AFAC) now known as International Arts and Crafts Expo (INAC) which will be held later in the year. It was agreed that INAC is a good platform upon which the best of culture of both nations can be displayed in term of Cuisines, Agriculture, Arts and Crafts, etc. On his part, the Gambia envoys appreciated the Director-general for being a man that is so passionate about the development of Culture and Tourism in Nigeria.’’ I have watched you keenly from afar and I have come to realize that you one Nigerian that I can work with because of the great assets and high level of dynamism you processed’’ he said. Ambassador Amadou S.O Taal was so delighted that he thanked Nigerians through the Director- General for the big brother roles Nigeria played to his country in ensuring that peace returned to his country in those years of their struggles. According to him, if not for Nigeria, the relative peace we enjoy in Gambia today would not have been possible.” The diplomat was of the view that it is high time both nations come together and partner in the areas of health, justice, culture and tourism as members of the same ECOWAS sub-region.. According to him, by so doing, our people will benefit hugely from the synergy. In conclusion, it was decided that a joint committee would be formed to fashion out other possible areas of collaboration by the two countries. 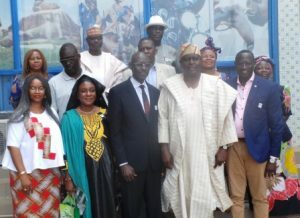 TOP MANAGEMENT OF NATIONAL COUNCIL FOR ARTS AND CULTURE AND THE GAMBIA DELEGATION IN A GROUP PHOTOGRAPH DURING THE VISITS.